Former Guantanamo Bay detainee Moazzam Begg has been remanded in custody after appearing in court charged with terror offences related to Syria. Mr Begg appeared at Westminster Magistrates Court and denied the charges of providing terrorist training and funding terrorism overseas. The 45-year-old from Hall Green, Birmingham, will next appear at the Old Bailey on 14 March. A woman arrested with him has also been remanded in custody. Gerrie Tahari, 44, of Sparkbrook, Birmingham, is charged with facilitating terrorism overseas. Both were arrested on Tuesday. Two other men arrested the same day remain in police custody. They are a 36-year-old man from Shirley, Solihull, and a 20-year-old man from Sparkhill, Birmingham, who were held on suspicion of facilitating terrorism overseas. BBC Midlands Today correspondent Peter Wilson tweeted that more than 200 people gathered outside the headquarters of West Midlands Police in Birmingham on Saturday afternoon to protest about the charging of Mr Begg. Mr Begg was held in the US-run military prison at Guantanamo Bay in Cuba for nearly three years. He was never charged with any offence. He is a British citizen who moved to Afghanistan with his family in 2001, before moving again to Pakistan in 2002 when the Afghanistan war started. He was detained in Islamabad in January 2002 and taken to Bagram internment centre in Afghanistan for about a year before being transferred to the Guantanamo camp. 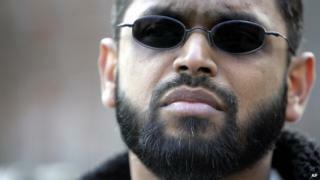 He was released in January 2005 along with three other British citizens and returned to the UK. Mr Begg, who is now a director of campaign group Cage which helps the families of people who have been detained, had never previously been charged with an offence.